The crystalline lens, or lens, is a bi-convex structure in the eye that is transparent and which works with the cornea to refract light to focus on the retina. It’s very similar in its working to a man-made spectacle lens. It’s this lens which changes shape to help the eye alter its focal distance so it can focus on objects at varying distances. In effect, it means that you can create a sharp real image of the object being viewed to be formed on the retina of the eye. The working of the lens as it adjusts, it is properly known as lens accommodation, is very similar to the process that a camera would use by moving its lenses to focus on an image. Interestingly, the crystalline lens is more flat on its front side than on the rear. How does the crystalline lens work? The amount of light entering the eye is controlled by the iris, which sits in front of the lens. The lens itself is ellipsoid in shape and it never stops growing as a person gets older; in adults, the lens is around 10mm in diameter. lens fibres, which make up most of the lens. For the lens to work, the ciliary muscles change the shape of the lens which enables the eye to focus on objects at different distances. There are a number of potential problems with the crystalline lens with, perhaps, cataracts being the best known. Cataracts themselves are opacities of the lens and some may be small and not need treatment while others will be big enough to block light and perfect vision. 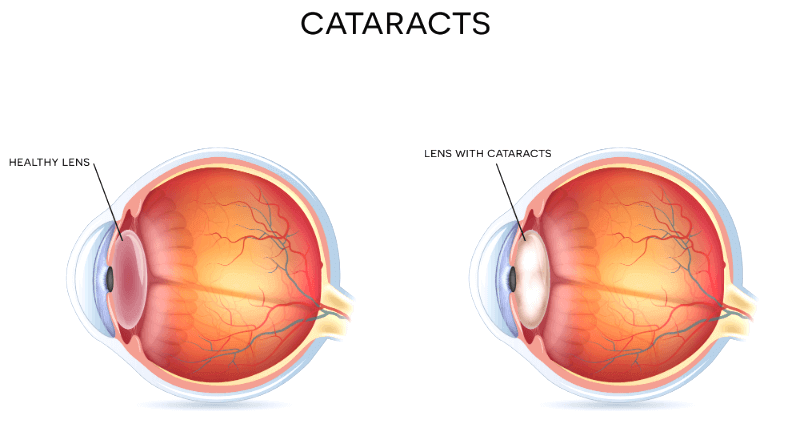 Cataracts usually develop as the lens becomes older and more opaque but they can be formed after an injury to the lens itself or congenitally. Diabetes is also a major factor in the development of cataracts. Cataracts can be operated on and the cataract surgery will see the removal of the lens and an artificial intraocular lens being inserted in its place. Aphakia – which is when there is no lens present in the eye, usually the result of injury or surgery but it could also be congenital. If you would like to find out more about the cataract surgery at Advanced Vision Care, then why not call AVC TODAY on 0800 652 4878 and request your free information pack or book your consultation to find out how we can help you.